The concept of a visual workplace is quite simple, but actually putting it into practice can be surprisingly difficult and complex in some cases. 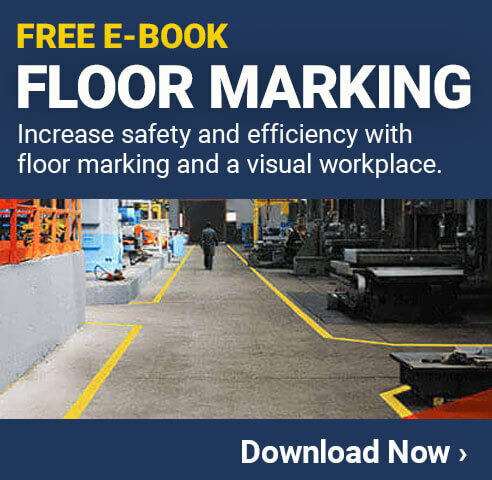 Using visual tools and strategies can help your facility operate more efficiently and also more safely, so it is definitely worth the effort. Fortunately, there are many different tips and tricks that can help you to implement or improve visual strategies within your factory. The following are some key tips that can help you throughout the process. These will give you ideas that can be used, or modified to help you to get the specific results your facility requires. One of the first things you need to keep in mind when operating a visual factory is that you can add visual cues just about anywhere in the facility. Whether you put up a sign on a wall, color code the pipes or use labels on containers, you should look to convey visual information in the best possible way, no matter where that may be. Walls – Of course, you can apply wall signs throughout your facility to share information. Walls are often ideal because you can put signs or other items at eye level so they are very easy to see. 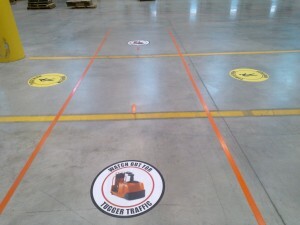 Floors – Floor markings, floor signs, and floor stickers are an excellent form of visual communication. Floors have a particular advantage in that the information is typically only seen by those who are in the immediate area, which makes it possible to display more specific information than would typically be done on walls. Machines – In many cases you can apply signs, labels or other visual items directly to certain parts of machines. The information can be specifically about that machine or useful for anyone who happens to be in the area immediately around the machine. Ceilings – Ceilings are almost always overlooked when planning a visual factory, but it can be very important. Using pipe marking labels, for example, can let people know what is in each pipe that travels along the ceiling of the facility. In some cases you can even hang signs from the rafters to convey messages to larger areas around the factory. Vehicles – Vehicles can be ‘mobile visual machines’ meaning that you can share information that is relevant to anyone who happens to be around that vehicle. For example, a sign that reminds people of the potential danger of pinch points can help people to be more cautious when near a high-low. There are, of course, many other areas in your factory that can be used to improve visual communications. Just make sure you are looking for the ideal place to convey a visual message and consider how it can be done most effectively. Another great idea for a visual factory is making sure you have the ability to make your own custom signs and labels. Many companies rely on pre-made signs, labels, markings and more to convey the messages they need to send in their facility. While there are certainly times when this is effective, it can also be very limiting. You can, of course, create your own signs and labels to be printed by a third party print shop. This is an effective way to get the visual items you need, but it can be quite costly and time consuming. The print ships can take several days to complete a job and then have it shipped to you. In addition, you either need to design the item yourself or work with one of their design professionals, which can be inconvenient. The last, and best, option is to have an industrial label printer (Check out our LabelTac Printers) available at your site. These printers can be used to create any type of label or sign you need immediately. It also gives you the option to use the specific label or sign medium that works for the situation it will be used in. While having an industrial label printer in your facility will require an upfront investment, it will actually save money in the long run. The savings on each item printed compared to ordering it from a print shop will add up over time, and the time saved is also very valuable to many companies. One of the most common, and useful types of visual communication in a factory is the visual board. A visual communication board can be used to track data, give work assignments, organize information and much more. There are many types of visual communication boards that can be used including dry erase boards, grid boards, cork boards and more. Whichever you choose to use in your facility, you need to make sure it is updated accurately and as often as needed. For example, if you have a daily tasks board you need to make sure it is properly updated prior to the start of a given shift. This will ensure people can quickly see what needs to be done when they arrive to work so they don’t waste time getting ready to work. Whatever you use your visual communication boards for, make sure they are actually useful for the facility and the employees in the area or they will quickly fall out of use and become more of a distraction than a benefit. Whenever you are using any type of visual communication strategies in your factory you need to make sure it is standardized throughout your company. This is especially important for companies that have multiple factory locations. Keeping everything standard will help ensure people throughout the facility can quickly understand the message that is being conveyed. Things that should be standardized include the meaning of different colors, pictograms, sizes and more. Visual communication cannot be effective if the employees don’t know what the different signs, labels and other items mean. For example, if you’re using red floor tape (similar to our SafetyTac line) to indicate that there is a potential for fire but people don’t know that, they can’t take the necessary precautions. With that in mind, your facility must provide training to everyone in the area whenever using visual communication. If you’re just implementing a visual strategy you can often do one large training session for all the employees. If you’re just looking to expand and improve an existing strategy you can ensure people are aware of the updates through one on one communication with their supervisors. When done properly, a visual factory can provide your facility with many benefits. 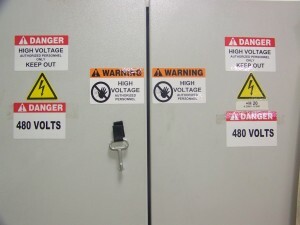 You can improve the overall safety of the facility by using safety labels and signs. You can also improve efficiently by conveying the needed information to the people in the area. Visual communication is often used to reduce or eliminate waste within a facility as well. In order to get all the possible benefits of visual communication within your facility, however, you need to make sure you’re using it properly. The above 5 visual factory tips are a great place to start, but make sure you continue to work on improving the way your facility uses visual communications over time to get continuous improvements. Make sure you check out Creative Safety Supply for all your visual tool needs.